The Iron Deficiency Elimination Action (Project IDEA) works to reduce micronutrient malnutrition through food fortification in developing countries. "Survey of Lysine Intake and Opportunities for Improving Lysine Intake in India"
"Work-place Nutrition Improvement Project by Introduction of Fortified Rice in Cambodia"
The Nutrition Japan Public-Private Partnership Project (NJPPP) was initiated by the Japanese Cabinet Secretariat, Office of Healthcare Policy 2 years ago. 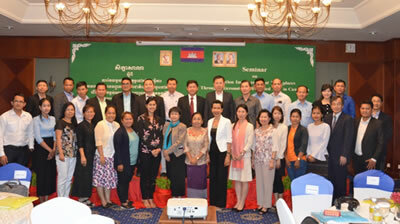 Under this project, the “Work-place Nutrition Improvement Project by Introduction of Fortified Rice in Cambodia” project was approved last year. In order to investigate the potential feasibility of this project, 2 members of ILSI Japan CHP visited government agencies, the international NGO (RACHA), and private companies from Japan in Cambodia during September 2017 and investigated whether the introduction of fortified rice to lunch menus in work-places could improve the nutritional condition of workers. In addition, a seminar was given to the people in charge of this project in February 2018. In the Philippines, ILSI CHP has worked with FNRI on the stability and acceptability of several alternatives for the fortification of rice with iron. The overall evaluation indicated that extruded rice with ferrous sulfate and micronized ferric pyrophosphate are the most stable and have the most acceptable taste and color. An efficacy study was conducted for 6 months in 2004 by means of an intervention program using primary school pupils 6-8 years old in Metro Manila. The intervention program demonstrated that both of fortification alternatives significantly improved anemia prevalence. A market trial started in April 2008 and confirmed the effectiveness in Orion Municipality. In Cambodia, fish sauce fortified with NaFeEDTA was introduced in Kampot in March 2007 and Siem Reap in August. ILSI Japan CHP is working with RACHA to promote social marketing programs, to establish quality monitoring of the market and to establish a surveillance system for monitoring IDA. The effectiveness of the fortification was confirmed. Akzo Nobel is supporting the project by donating NaFeEDTA. A literature search on complementary feeding resulted in the report "Towards improved infant and young child nutrition in Asia through appropriate complementary feeding" which can be used as a basis for the research and development of complementary feeding. In Vietnam, in collaboration with National Institute of Nutrition (NIN), ILSI CHP has pursued iron fortification (NaFeEDTA) of fish sauce. A series of studies verified that regular consumption of iron-fortified fish sauce significantly reduced the prevalence of anemia. Iron-fortified fish sauce was launched in 2006 based on the scientific outcomes of the research and development. The plan calls for 10 large production plants to produce fortified fish sauce by 2009. With financial support from GAIN, the national launch is scheduled in 5 years, which will include programs for production/distribution, quality assurance, communication of nutrition and health and monitoring/surveillance. ILSI Japan CHP will continue to provide professional support to ensure a successful national launch. In China, the Iron Fortified Soy Sauce Program has been launched since 2004 as the national policy to prevent anemia by ILSI Focal Point in China and CDC China. The National Anemia and Nutrition Risk Factor Survey (1995) reported that anemia is highly prevalent (40-50%) among children and women of reproductive age. The study concluded that more than 80% of the national population consumes commercially produced fish sauce regularly. Also the study concluded that NaFeEDTA has high potential as an iron fortificant in fish sauce due to favorable taste, color and smell. The storage and stability test concluded that the addition of NaFeEDTA makes fish sauce slightly darker, but this color change occurs to ordinary fish sauce by a natural degradation process. Also the study recommended using amber glass bottles or clear bottles under indirect or limited sunlight to prevent accelerated degradation (1). The bioavailability trial confirmed that daily intake of iron fortified fish sauce positively influenced the iron status of the study participants (2). The sensory evaluation was conducted using 85 Vietnamese women, who compared the color, flavor, taste and overall acceptability of iron-fortified fish sauce (5mg Fe/10ml) and ordinary fish sauce. No significant difference in sensory profile between two types of fish sauce was found. A randomized controlled trial was conducted with 152 anemic women in the Red River Delta of Vietnam. The study participants received either 10mg iron as NaFeEDTA / 10ml fish sauce or non-fortified fish sauce with lunch, six days per week for 6 months. At the conclusion of the trial, hemoglobin and serum ferritin concentrations were found to have improved in the intervention group. The study identified that regular consumption of fish sauce fortified with NaFeEDTA improved iron status significantly and decreases the prevalence of anemia (3). A randomized double blind village-based intervention study was conducted over 18 months. All families of two communes (an estimated 14,000 people) received iron fortified fish sauce (5mg/10ml). Results obtained from selected group of 288 women verified that the hemoglobin concentration increased and the prevalence of anemia decreased following daily intake of iron fortified fish sauce (4). Based on these findings, NIN received financial support from GAIN (Global Alliance for Improved Nutrition) to initiate the national launch of an iron fortified fish sauce program. The program called for 10 large fish sauce factories to produce iron fortified fish sauce over 5 years. The program consisited of production/distribution, quality assurance, social marketing/consumer education and monitoring/surveillance. ILSI Japan CHP provided professional support to ensure a successful national launch. 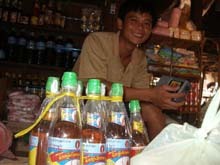 By the end of the program, more than 575,000 people had access to iron fortified fish sauce nationwide. According to the National Anemia, Nutrition Risk Factor Survey, 2000, the prevalence of anemia in preschool aged children was 34.1% and in women of reproductive age it was 24.3%. The study found that rice is the staple food in Vietnam, consumed in approximately the following amount, 400g/person/day. A randomized control trial was conducted using 250 women (20-49 years old) in garment factories in Hung Yen Province, Vietnam for 6 months starting in May 2010. 15mg Fe/ 150g rice was served as lunch. The premix rice used in the study was produced in the FNRI (Food and Nutrition Research Institute, the Philippines), using an extrusion technology. The evaluation includes anemia status and impact on vitamin A, zinc and selenium. The study indicated that regular consumption of iron fortified rice significantly reduced anemia prevalence and helps absorption of Vietnam A and zinc. According to the National Nutrition Survey (1998), the anemia prevalence is approximately 35% for children 7-9 years old, 36% for women of reproductive age, and 51% for pregnant women. 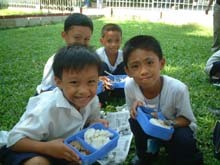 The study found that rice is the stable food in the Philippines and is consumed 3 times per day, average 386g/capita/day. The study was conducted using the iron premix rice, enriched rice (iron fortified rice) and cooked iron fortified rice with different packaging materials over 10 months. The evaluation analyzed color, texture, bulk density, infestation, iron content, microbial properties, sensory properties. The overall evaluation indicated that extruded rice with ferrous sulfate and micronized dispersible ferric pyrophosphate are the most stable and have the most acceptable taste and color. A randomized controlled trial was conducted with 180 primary school pupils, 6-9 year olds, for 6 months in Metropolitan Manila. The pupils were divided into 3 groups and received either rice fortified with either ferrous sulfate, rice fortified with micronized ferric pyrophosphate, or ordinary rice for lunch 5 days a week. The study demonstrated that both fortification alternatives (ferrous sulfate and micronized ferric pyrophosphate) significantly reduced anemia prevalence (5). A market trial was conducted in Orion Municipality (population about 52,000), Bataan province. Premix rice containing 6mg Fe/g was produced using micronized dispersible ferric pyrophosphate by an extrusion process in Japan for this study. The premix rice was blended with ordinary rice in a local mill at a ratio of 1:200 to have iron-fortified rice containing 3mg Fe/100g. The iron fortified rice was distributed through a normal market distribution channels, its quality was checked periodically, and this was supported by social marketing. Market surveys showed high availability and high acceptability of the iron-fortified rice and improved awareness of anemia and the iron fortified rice. The prevalence of anemia significantly decreased among children (6-9 years old) (from 17.5% to 12.8%).The study also demonstrated that political support and social marketing activities were crucial elements in commercializing iron fortified rice (6). According to the Demographic Health Survey (2000), the anemia prevalence is approximately 57% among children, and 62% among women of reproductive age. The study conducted in Kampot province showed that 62% of families used fish sauce 7 days a week, for an average of 26ml/meal/family. The study concluded that the fish sauce is an appropriate food vehicle for fortification with iron in order to decrease the high prevalence of anemia in Cambodia. The storage and stability test conducted in Japan showed that the iron fortified fish sauce darkened the fish sauce slightly, particularly fish sauce made with river fish which start as a clear amber color. The sensory evaluation was conducted using 90 Cambodian people using iron fortified soy sauce and iron fortified fish sauce. There was no difference in the preference scores between iron fortified soy sauce and ordinary soy sauce. For the iron fortified fish sauce, the preference scores of aroma, color, and taste were significantly higher than those of ordinary fish sauce. The randomized controlled trial was conducted with 140 anemic school children (6-21 years old) in Kampot province. 10ml of fish sauce were served as lunch meal for 17 weeks. The study indicated that regular consumption of iron fortified fish sauce under strict control significantly improved iron status among anemic school children (7). A market trial using iron fortified fish sauce and soy sauce was conducted in Kampot province, Siem Reap province and Phnom Penh for 2 years. Three fish sauce and soy sauce factories at each study site installed fortification facility and produced iron fortified fish sauce and soy sauce containing 4mg Fe/10ml. The iron fortified fish sauce and soy sauce were distributed through normal market channels, its quality was checked in provincial laboratories. The social marketing and health education was provided through RACHA's network. The result demonstrated that the consumption of fortified fish sauce and soy sauce significantly reduced anemia prevalence and improved iron status among anemic people. In July 2010, the workshop was held to develop consensus among stakeholders on action necessary to sustain and expand iron fortification programs using fish sauce and soy sauce as a strategy for reducing IDA throughout Cambodia. A proposal for a national launch was agreed to by the Global Alliance for Improved Nutrition (GAIN) in March 2011. Inviting industries and government officials, the national workshop for launching project iron fortified fish sauce and soy sauce was held in Novermber 2011. A national kick-off meeting will be held in 2012. Fidler, et. al., Photostability of Sodium Iron Ethylenediaminetetraacetic Acid (NaFeEDTA) in Stored Fish Sauce and Soy Sauce, Journal of Food Science, Dec 2004, Volume 69, Issue 9, pages S380-S383. Fidler et. al., Iron absorption from fish sauce and soy sauce fortified with sodium iron EDTA, Am J Clin Nutr. 2003 Aug;78(2):274-278. 3 Pham et. al., Regular consumption of NaFeEDTA-fortified fish sauce improves iron status and reduces the prevalence of anemia in anemic Vietnamese women, Am J Clin Nutr. Aug 2003, Vol. 78, No. 2, 284-290. 4 Pham et. al., The Use of NaFeEDTA-Fortified Fish Sauce Is an Effective Tool for Controlling Iron Deficiency in Women of Childbearing Age in Rural Vietnam, J Nutr. 2005 Nov;135(11):2596-601. 5 Angeles-Agdeppa et. al., Efficacy of iron-fortified rice in reducing anemia among schoolchildren in the Philippines, Int J Vitam Nutr Res. 2008 Mar;78(2):74-86. 6 Angeles-Agdeppa et. al., Pilot-scale commercialization of iron-fortified rice: effects on anemia status, Food Nutr Bull. 2011 Mar;32(1):3-12. 7 Longfils et. al., A comparative intervention trial on fish sauce fortified with NaFe-EDTA and FeSO4+citrate in iron deficiency anemic school children in Kampot, Cambodia, Asia Pac J Clin Nutr 2008;17 (2):250-257.